You guys maybe wondering what have I been up to, since I haven’t been posting much lately in my blog. Well, things have been quite busy for me, both personally and professionally and you all know the Christmas season is pretty much a time where we barely have time to breathe, let alone spend some time around my favorite hobby. But I’ve finally got my things tidied up and first thing I wanted to share with you was a summary of what happened with my blog last year. I started off with my old blog (in blogger), which was my blog since 2008, and although I only started posting regularly since June or so, I got impressive numbers (at least for me) during those 3 or 4 months before I switched my blog to my website. As you can see on the picture below, I managed to get over 1600 pageviews in 2012, with the peak at August where I reached 483 pageviews in one month! But definitely the big event (again, for me) of 2012 was the release of my own website, fully designed and created by me (OK, with WordPress and Responsive Theme as a base). I never had my own website, so this was a huge endeavor for me but it turned out to be quite rewarding, just by looking at the stats. 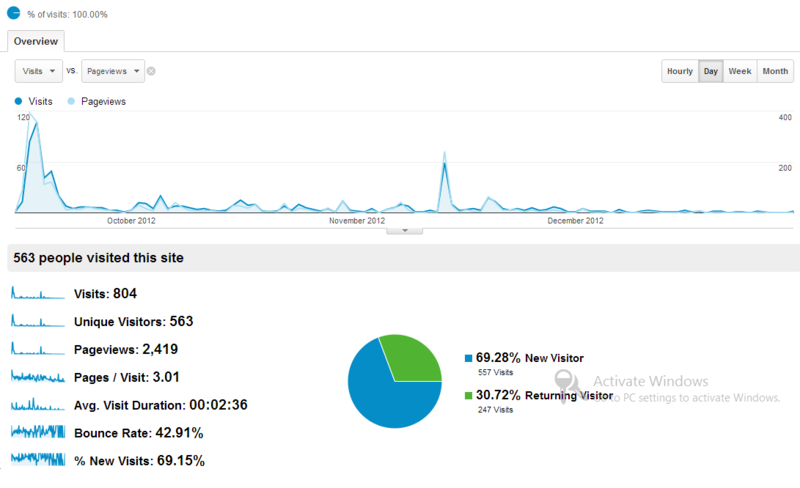 According to Google Analytics, I had over 2400 pageviews from September 15th to December 31st! That is absolutely amazing! I mean, I am no “known” game designer, techie blogger or whatever, I’m just a guy who loves to make games and is trying really hard to make as many games as possible in his own free time (very little), so these results are astonishing for me! 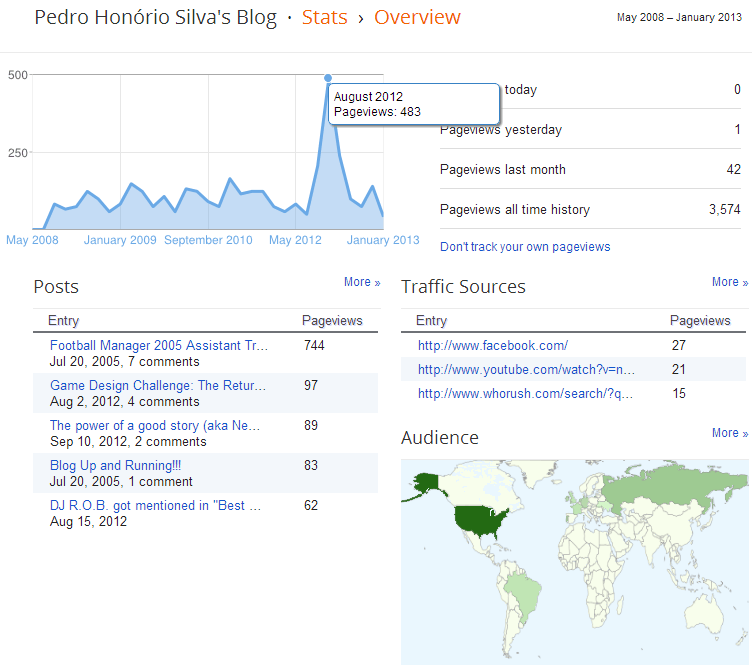 This means that I had over 4000 pageviews in 2012 (4052 to be precise), if I sum Blogger’s and my website’s Stats! Wow! This is all very interesting data for me to analyze. And it gives me a HUGE amount of strength to keep on posting about the things I love to do. I might start to write a little bit about programming as well, as I have become increasingly more active on that side recently. Keep posted for more news! Happy 2013 full of professional and personal success and health!